In understanding what a Knowledge Management System (KMS) is, it's important to make the distinction between data and knowledge. Whereas data are simply pieces of information, knowledge really refers to meaningful and interpreted data that have been collected into information. So a data management system may simply be an app that manages a database, containing any amount of "dumb" records. 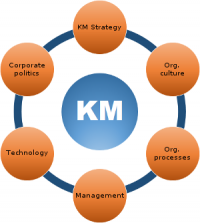 A KMS may contain things like white papers, reports, SOPs, mission statements, QMS systems, information about products and services, designs, etc. A Wiki is an example of a KMS. The SciCLoud.net® Marketplace contains a wide assortment of apps, including KMS apps. These KMS apps include open source apps such as Mediawiki. As with all apps available in the community, there are also dedicated communities for each, with support, and additional plugins and add-ons for each. If you'd like more information about KMS Apps or you have questions about SciCloud.net® services and/or applications, contact sciCloud.net Support, search the Marketplace for qualified services or contact LabLynx at LabLynx Contact Us, or 770.859.1992 (toll-free at 800.585.5969). ↑ "Data, Information and Knowledge". University of New England. 01 Nov, 2004. http://turing.une.edu.au/~comp292/Lectures/HEADER_KM_2004_LEC_NOTES/node4.html. Retrieved 08 November 2016.